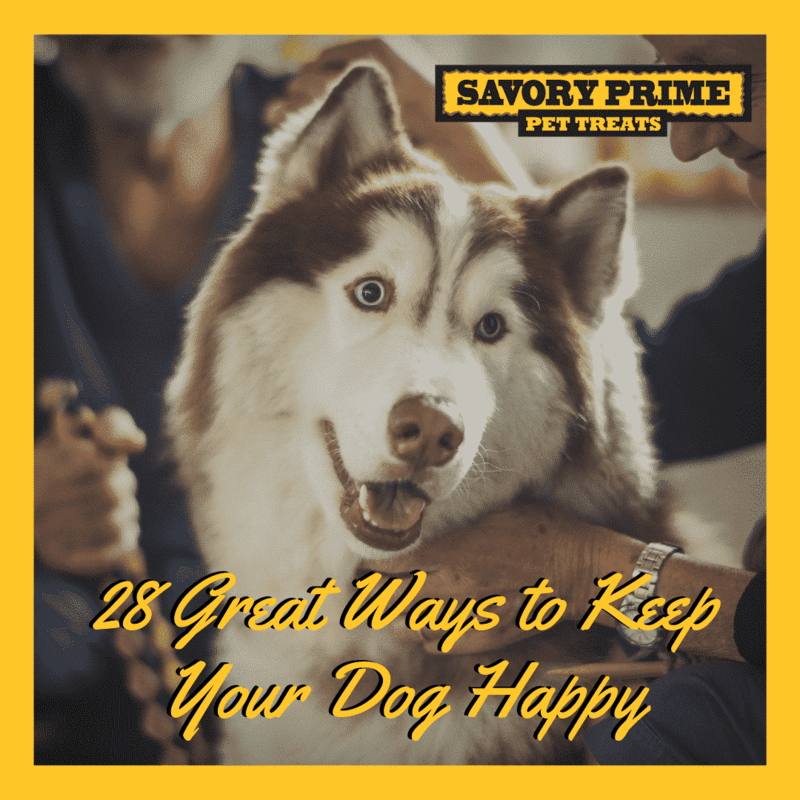 Today is February 28, and what a good day to share tips and tricks for great ways to make your dog happy? You’ve come to the right place. 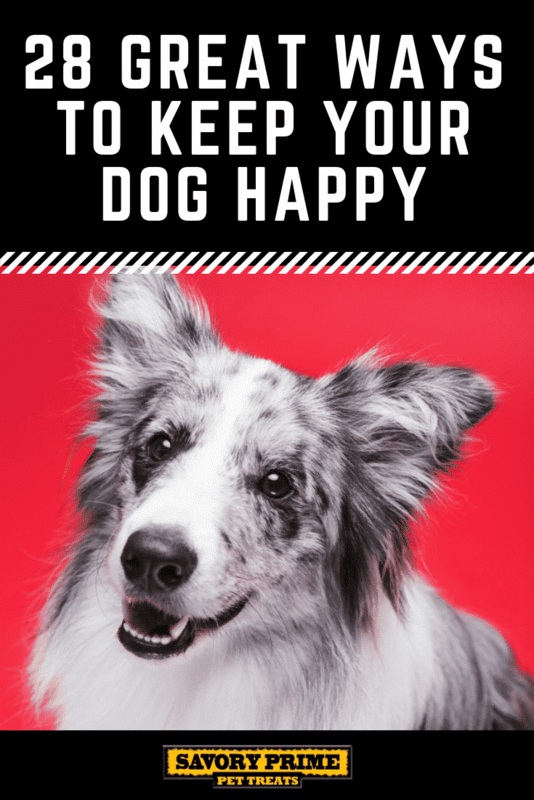 From a little more snuggle time on the couch to switching up your dog walking routine, here are 25 ways to keep your dog happy. Looking to give your dog a little more excitement? Take your dog to the local park or trail for a hike. It’s great physical exercise, and the change of scenery (and all those smells) will give your dog plenty of extra mental stimulation. If your dog isn’t conditioned for hiking start with some shorter hikes and gradually increase your distance. And always remember to bring along plenty of fresh water for your dog. Dogs love to play and engaging in some indoor games such as hide & seek is an easy way to make your dog happy. To play hide and seek, have your dog stay while you go find a hiding spot. Once situated call your dog and praise them when they find you. I was skeptical about how much my dog would enjoy this game, but to my surprise, she absolutely loves it (even though I keep picking the same 3 hiding spots). If your dog doesn’t have a good ‘stay’ you can enlist the help of someone else to distract your dog while you find your hiding spot. Using a treat dispenser for your dog’s meals gives them a fun problem to solve, and it adds a lot of extra mental stimulation to their routine. And adding more mental stimulation into your dog’s day can cut down on problem behaviors such as excessive barking and chewing. There are plenty of food dispensers available on Amazon. My personal favorite is the Bob-A-Lot because it’s durable, dishwasher safe, and you can adjust the size of the hole the food/treats come out of. 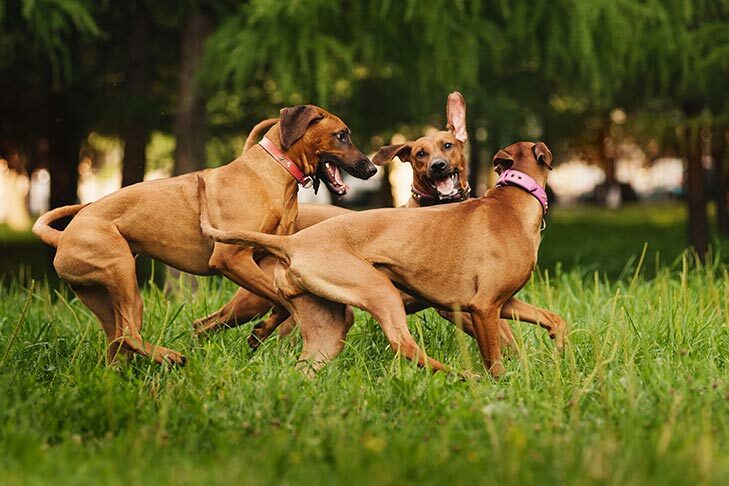 One easy way to make your dog happy is to invite them along for a social gathering. Next time you’re going out to visit with your family or friends let your dog tag along. Dogs are social animals, and giving your dog a chance to hang out in a controlled setting (versus a dog park which can be intimidating and over stimulating) is a great way to let them interact with others. Most dogs love going for a ride, and surprising them with a fun social gathering is a great bonus. Does your dog love watching you cook? If so give them a nice surprise by making some yummy homemade dog treats. It’s comforting to know exactly what goes into your dogs treats, and some recipes are pretty easy to make – even for a novice like me. Not sure what kind of treats to make? 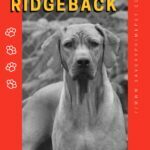 Check out this list of my favorite simple dog treat recipes, all made with 5 ingredients or less. Dogs love having a routine, and Laika adores our “cuddle up on the couch for some TV” routine we do every evening. In fact, if I’m not on the couch by 9:30 pm she’ll start whining about it, just as she does when she doesn’t get her to walk on time. Cuddling on the couch is a nice way to get your dog to settle down and relax at the end of the day. And dogs aren’t picky about what to watch so you don’t have to worry about fighting over the remote. A quick game of fetch is a lot of fun for your dog, even if it seems a little mundane to us. You’d think after throwing the same exact toy 10 times in the same exact direction they’d get sick of it, but for my dog, nothing could be further from the truth. Fetch is a simple way to have some extra fun with your dog, and as far as entertaining them goes it’s pretty simple; you toss a toy and let them do all the hard work. 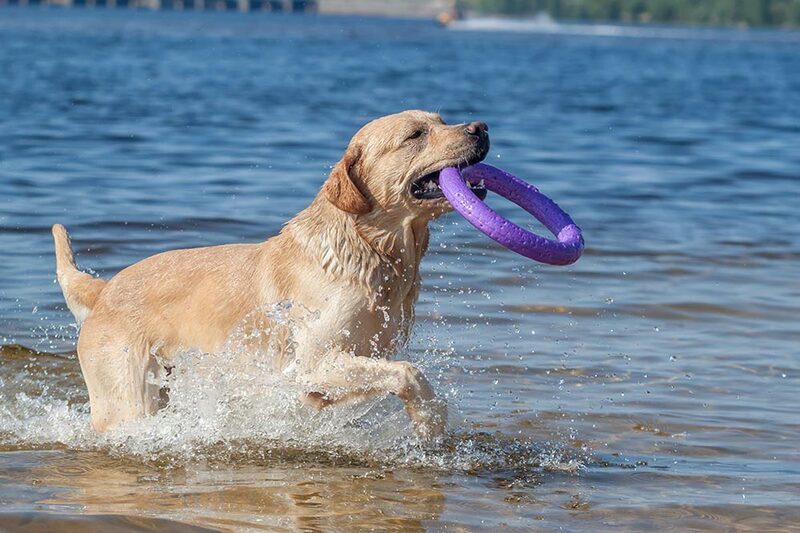 If your dog loves the water plan a trip to your local beach or lake for a fun outing. Swimming is fun, and it’s the perfect exercise for older dogs or those with joint issues such as arthritis since it’s low impact. If your dog isn’t used to the water remember to take it slow and use a doggie life jacket if you’re going to be heading into deep water. 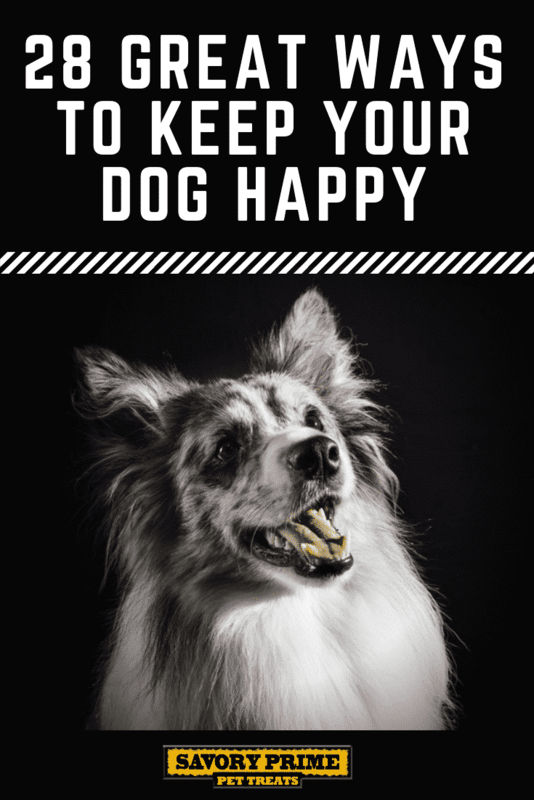 Looking for a simple way to make your dog happy? Let them sniff on walks. Walks are about more than just physical exercise for our dogs; it’s the one time of day they get to go out and see what’s going on in the neighborhood. When we’re out walking we check out what’s going on with our eyes, but our dogs use their noses. Letting your dog sniff around on walks gives them a chance to check out & explore the world around them. You can make your dogs walk more enjoyable by stopping for a few minutes and letting them smell all of the things. Walking the same exact route every day gets dull, and that lack of enthusiasm can make it hard to stick to your daily walking routine. One of the ways I stay motivated for our dog walk is by taking a different route. 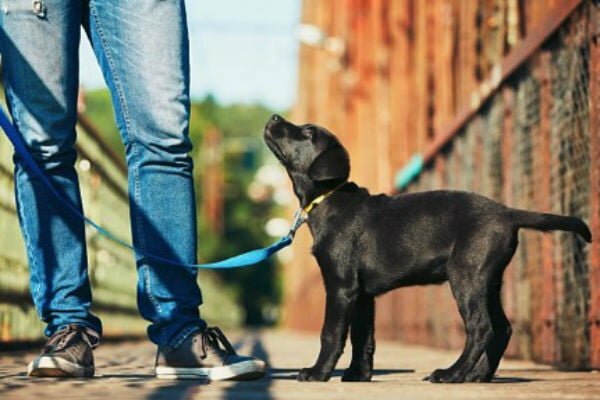 You can walk in a different neighborhood, take your dog to the local park, or simply follow your dog and let them decide where to go. Does your dog get bored with his toys? If so you can make old toys feel new again by rotating them. Instead of having all of your dogs toys out all the time try giving them access to a couple at a time, and switch them around every week or month. Once your dog hasn’t seen that squeaky hippo for a couple of weeks he’ll be super excited the next time it appears. If you spend a lot of time out in the yard with your dog get them a kiddie pool. They’re a lot of fun for dogs to play in (Laika’s fascinated by splashing around in hers), and they can help them cool in the summer. I’d recommend sticking to the hard plastic kiddie pools rather than soft ones since it doesn’t take much for dog nails to tear through soft surfaces. Do any of your friends, family or neighbors have a dog that gets along well with yours? If so arrange a play date for them. Invite them (and their owner) over for an afternoon. Take a walk, chill out in the living room or hang out in your backyard. You can catch up with their owner while the dogs play together. We love a good massage because they relieve stress and are so relaxing, and the same can be true for our dogs. Giving your dog a massage can be relaxing for them, and it’s a great way to help them wind down at the end of the day. They’re also great for dogs with arthritis since stimulating muscles and tissue can improve circulation. 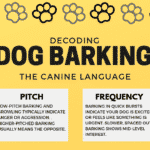 Dogs love learning new things, but their attention span isn’t limitless. Dogs get bored and frustrated when training sessions go on too long, and that can lead to both of you getting flustered. 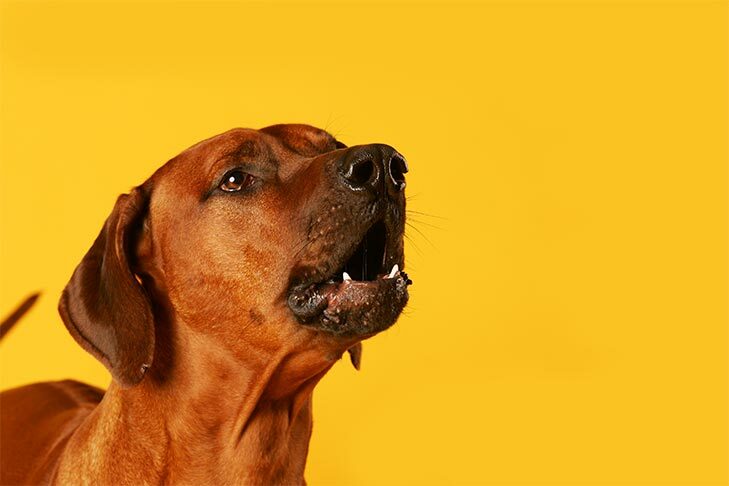 One way to make training sessions more enjoyable for your dog is to keep them short & sweet. Rather than using a full 30 minute span to train your dog break it up into 4 or 5 shorter sessions. Stuffed Kong toys are such a life saver. They’re such an easy way to entertain your dog, and they’re pretty low on the scale when it comes to effort involved on my part (choosing the treats is the toughest part). And if you want a stuffed Kong to last even longer just freeze it overnight. A frozen Kong keeps Laika busy for 30+ minutes, and for something that takes such little effort from me it doesn’t get much better than that. If you’re not sure what to use for stuffing check out my list of 39 healthy treats for Kong stuffing. Many dogs dislike going to the vet but finding one you’re comfortable with can make a huge difference. If you’re already nervous before even stepping into your vet’s office your dog is going to pick up on that. Does your dog love new toys? Instead of going out to the store to buy some give your dog a nice little surprise by making some DIY dog toys of your own. Like us, our dogs love new things — and making a DIY dog toy is an easy way to make them happy. If your dog loves to chase make them their own flirt pole. Does your dog enjoy ripping the stuffing out of toys? Make them their own restuffable dog toy. If your dog loves tug to make a new tug toy out of some old jeans. Does your dog love treat dispensing toys? You can make your own treat dispenser out of an old plastic container. You can make your dog happy by giving them their own little jobs to do throughout the day. Many of our dogs were bred to work alongside humans, so giving them a few chores to do can play into their natural willingness to work. (and it’s a great way to give them plenty of mental stimulation) Teach them to fetch your slippers, carry in the mail or help you pick up sticks around the yard. Dogs love having things to do, and there’s plenty of little tasks you can teach them to do so throughout the day. Did you know that some stores have a secret menu for dogs? If you want to take your dog out for a fun little adventure try taking them out for a nice treat. 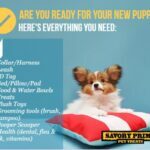 Starbucks offers Puppucinos, Sprinkles Cupcakes has special doggie cupcakes, and most pet store chains offer plenty of dog-friendly treats to choose from. Dogs love chewing, and having a few sturdy chew toys can help entertain your dog during downtime. Chew toys are perfect to have on hand for days when you’re not feeling well. When I’m sick I’ll give Laika a chew toy to occupy her time; it keeps her busy while I rest up. Some toys are much tougher than others, so keep in mind that it might take a few tries before you find a chew toy that’s tough enough for your dog. My favorite game to play with my dog Laika is a game of hide the treats. I chop up a carrot or two into bite-size pieces (any healthy treat will do) and hide them throughout the house while she’s not looking. After they’re are all hidden I tell her to go “find the treats” and watch as she takes off with giddy excitement. Find the treats, like all nose work games, is a way for dogs to use their natural sniffing abilities in a fun and engaging way. Some dogs don’t know how to remain calm in certain environments, so teaching them how to relax is a great skill for them to learn. Some dogs get fearful and/or overly stimulated by certain things and need to be taught how to calm down; it doesn’t always come naturally. Teaching your dog how to relax can reduce reactivity, it can relieve stress, and it’s a great way to brush up on your dog’s impulse control. Dogs love it when they hop in a car and start joy riding for his/her sake. Nothing brings a smile on my face more of himself when she sticks her face out the window tongue sticking out. So take your dog next time you need to make a quick stop and back from errands. Temperature extremes can represent both a long-term and acute hazard for dogs. While minor cases of hypothermia or hyperthermia cause no long-term damage, it only takes a brief exposure to very high or very low temperatures to result in death. 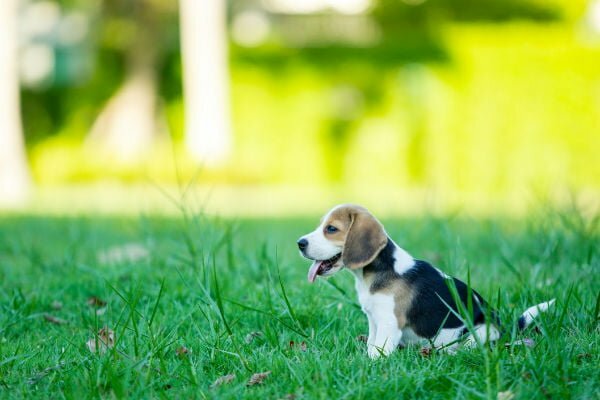 In most cases, you’ll need to do nothing more than use common sense and observe your dog’s behavior to avoid temperature-related health problems. 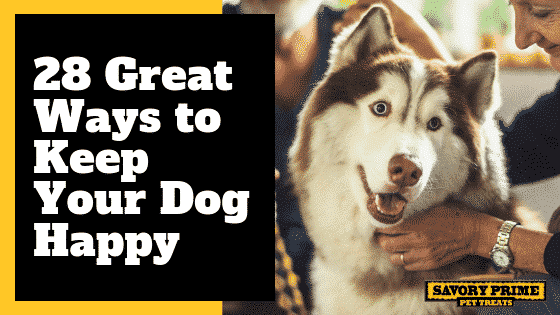 Just be sure that you recognize the signs of serious problems – including incoordination, excessive panting, lethargy, and seizures, among others. Even the highest-quality food and water dishes become coated in a layer of bacteria within a few hours of being used. And while dogs have robust digestive systems relative to our own, some of these bacteria can cause serious illness: Your dog’s body may, for example, be able to neutralize most of the Salmonella strains she encounters, but the wrong one may confound her immune system, leading to serious illness.